The small town of Assisi is one of the Christian world’s most important pilgrimage sites as it is home of the Basilica di San Francesco. This small town has been an important place of pilgrimage for over 700 years and today now attracts an estimated 5 million visitors each year. Perched high above the flat valley floor next to Monte Subasio, the cobbled streets of Assisi wind across the hill with spectacular views of the valley below. Like most other towns in the region, Assisi began as an Umbrian settlement in the 7th century BC, was then conquered by the Romans 400 years later. 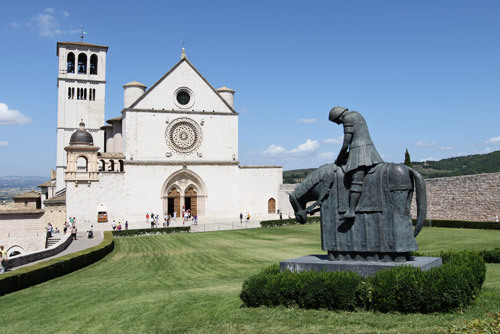 Although the town was Christianized by Saint Rufino, its patron saint in the third century, Assisi will always be known for Saint Francis, a patron saint of Italy who founded the Franciscan monastic order. It is said though, that even without its amazing churches and extraordinary works of art, that it is worth visiting Assisi simply for the sunset. As the sun sets, the entire town is bathed in a warm glow as the sun brings to life the reddish hues of the stone from Monte Subasio that was used in building most of the buildings in town. Assisi has now recovered from the devastating earthquake of 1997 which all but collapsed the Basilica although some minor works of art were forever lost. How To Get To Assisi - There are hourly trains arriving at the train station in Santa Maria deli Angeli from Foligno and Terontola which is located 5 km from Assisi. Buses run from the train station to Piazza Unita d’Italia in Assisi every 30 minutes. The main bus terminal in Assisi is located in Piazza Matteotti, above the Duomo which has a full schedule of departures and arrivals to and from many of the local towns. There is one long distance bus that heads to Piazza Adua in Florence and Naples from Piazza San Pietro. You can buy tickets on the bus, or at the Stopini agent at Corso Mazzini 31. If arriving by car, Assisi now has many car parks just outside the town since parking in the center is impossible. A large underground parking structure can be found at Piazza Matteotti, or in Piazza Unita d’Italia. Other car parks can be found at Porta Nuova and Porta Moiano. What To See in Assisi - The Basilica di San Francesco ranks second only to St Peter’s in Rome as a point of Catholic pilgrimage. The magnificent paintings found within the Basiclica by Giotto have long been considered on of the turning points in Western art, moving from the Byzantine world of iconic saints and Madonnas, to one with a much more humanist view. The Basilica was built in two tiers, with the Upper Church situated above the Lower Church. Construction of the lower church began 18 months after the death of Saint Francis in 1226 in his honor and was consecrated by the Pope in 1253 although the chapel of Santa Caterina was not completed until 1367. Lower Church – The lower church displays stained-glass windows from Germany, England, and Flanders brought to Assisi during the 13th century. In the center of the lower church above the main alter are four frescoes attributed to Maestro dell Vele, a pupil of Giotto which represent what St Francis described as “the four greatest allegories”, including evil, poverty, obedience, and chastity. When you first enter the dark lower church, in the first chapel to the left is a set of frescoes by Simone Martini depicting scenes from the life of St. Martin. In the transept to the left, Pietro Lorenzetti’s Madonna and Child With St. Francis and St. John can be found which sparkles when sunlight strikes it. In the right transept, Cimabue’s Madonna Enthroned Among Angels And St. Francis can be found surrounded by paintings of scenes from the childhood of Christ created as well by students of Giotto. Close by is a painting of the crucifixion completed by Giotto himself. Another area of the lower church not to be missed is below the church in the crypt where the stone coffin that holds the body of St. Francis can be found. Upper Church – The upper church was built shortly after the lower one between 1230 and 1253 and has a completely different feeling and look to the darker, more austere lower church. Possibly one of the most famous pieces of art in the world is the 28 part fresco circling the church walls that has been attributed to have been completed by Giotto. Above each image is a corresponding biblical fresco from both the Old and New Testaments. The choir has 105 inlaid stalls that were completed in the 15th century of great detail, most depicting famous Franciscans. The central throne is a papal seat, the only one in the country outside of St. Peter’s Basilica in Rome. Behind the throne and in the left transept are frescoes by Cimabue. Just a short walk from the Basilica along Via Frate Elia you will find the Church of San Pietro which was founded along with the monastery by the Benedictines in the 10th century. The church was consecrated in 1254. San Pietro has now been restored to its previous Romanesque-Gothic state, and although its interior does not boast any important works of art, its simply and high nave are worth a visit. East of San Pietro you will come to Piazza del Vescovado which was an important square back in the Middle Ages. It houses the Palazzo Vescovile or Bishop’s Palace and the Church of Santa Maria Maggiore. The church was thought to have been built in the 10th century, but was rebuilt in 1163 with the Romanesque look it has today. On the hill above Assisi sits the Rocca Maggiore dates back to Charlemagne who is said to have raised the first walls here after attacking the town. Cardinal Albornoz who arrived in the area in 1367 to assert Papal authority repaired the castle. The views from the top are well worth the trip and you can climb to the top of the polygonal tower. At the opposite end of Assisi from the Basilica di San Francesco you can find the large Basilica di Santa Chiara. This church is well worth a visit to see the large rose window, flying buttresses, and large piazza out in front that has some amazing views of the local countryside. Inside the church are some frescoes that have yet to be restored, and in the crypt below, Clare’s body can be seen in her tomb. In a cabinet nearby are locks of her hair and one of her cloaks. Clare was born into a prominent noble family, but renounced her wealth to follow the example of St. Francis even going as far to set up the convent at San Damiano known as the Poor Clares. Assisi’s 12th century Duomo can be found just east along the narrow streets from Piazza del Comune. The Cathedral di San Ruffino has a typical three tiered facade and Romanesque portal. It is thought that the first church was built on the site to hold the bones of San Ruffino back in 412. San Ruffino was Assisi’s first Bishop and was martyred 170 years before construction of the church began. Inside the church is the font that was used to baptize St Francis, St. Clare, and even possibly the emperor Frederick ll. If you leave Assisi from Porta Nuova, after a 15 minute walk you will come to the Santuary of San Damiano, a Franciscan church that was said to be one of the most important places in the life of St. Francis. It was here that it was said St. Francis heard the voice of God asking him to repair the church spoken through the crucifix which now can be found in the Basilica di Santa Chiara. At the bottom of the hill, 4km from Assisi you will come to the Basilica di Santa Maria deli Angeli where it is said St. Francis came to live after abandoning all his worldly possessions to live in a small chapel in the woods. St. Francis founded his order of friars here, and even died here in 1226. Although the small chapel, oratory of the Porziuncola still exists today, a grand basilica was built to accommodate it on the spot of pilgrimage by Pope Pius V in the 16th century to honor St. Francis. The great cupola outside along with one of the two bell towers was built by Galeazzo Alessi in 1667. Inside the huge church, along with the old oratory (Capella della Porziuncola) is the Capella del Transito, the old infirmary cell where St. Francis died in October 1226. The chapel even contains the original door. Basilica di San Franciso is open 6:30am to 6:30pm Monday through Saturdays from Easter through October. The Basilica is open 6:30am to 7:15pm on Sundays and Public Holidays. Settimana Santa is celebrated with processions and performances and held during Easter week. Festa di Calendimaggio is a colorful festival which celebrates spring in medieval fashion. The festivities begin the first Thursday after May 1st. Festa di San Francesco is the main religious celebration and takes place yearly on October 3 and 4. Marcia della Pace is Europe’s largest peace march. It began in 1961 and attracts thousands who walk the 24 km route between Perugia and Assisi the first week in October. Branch Office – Outside of Porta Nuova from Easter to October 8th.